The winery and cellar door are set in leafy, park-like gardens and guests can wander around, taste a good selection of wines and if peckish, enjoy lunch on a sunny verandah – as we did. 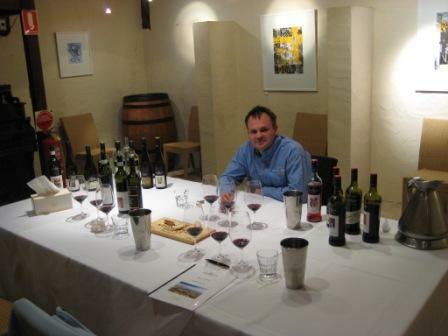 Winemaker Ian Hongell showed us a selection of releases. Standouts included the perfumed, limey 2008 Barossa Riesling; a lemon zesty 2008 Barossa Semillon and the 2005 Wigan Eden Valley Riesling – this showed a classic developed nose of aromatic lemon skin oil and lovely Granny Smith apple acidity. Then there was a 2008 Barossa Shiraz, showing deep, almost black shades, a spicy sweet oak nose and a hint of chocolate above its chewy tannin infrastructure. I also enjoyed the 2005 Stonewell Shiraz – a rich nose with a slightly savoury edge of tapenade and a robust palate of persistent blackberry notes. This entry was posted on 21 October 2010 at 02:38 and is filed under Wine Travel. You can follow any responses to this entry through the feed: RSS 2.0. You can leave a response, or trackback from your own site.